• When removing, always use a remover tool that is made of plastic. • Never damage the body. 1. Remove front pillar garnish (LH and RH). Refer to INT-18, "FRONT PILLAR GARNISH : Removal and Installation". 2. Disconnect harness connector (A) from headlining and harness clips. 3. Remove center pillar upper garnish (LH and RH). Refer to INT-21, "CENTER PILLAR UPPER GARNISH : Removal and Installation". 4. Remove back door weather-strip. • TYPE1: Refer to DLK-170, "BACK DOOR WEATHER-STRIP : Removal and Installation". • TYPE2: Refer to DLK-333, "BACK DOOR WEATHER-STRIP : Removal and Installation". • TYPE3: Refer to DLK-468, "BACK DOOR WEATHER-STRIP : Removal and Installation". • TYPE4: Refer to DLK-584, "BACK DOOR WEATHER-STRIP : Removal and Installation". 5. Remove luggage side upper finisher (LH and RH).INT-32, "LUGGAGE SIDE UPPER FINISHER : Removal and Installation". 6. Remove all assist grips. 1. Disengage pawl of assist grip clip (1) using a remover tool (A). Slide assist grip clip forward and remove it. 2. Slide assist grip (2) forward and remove it. 7. 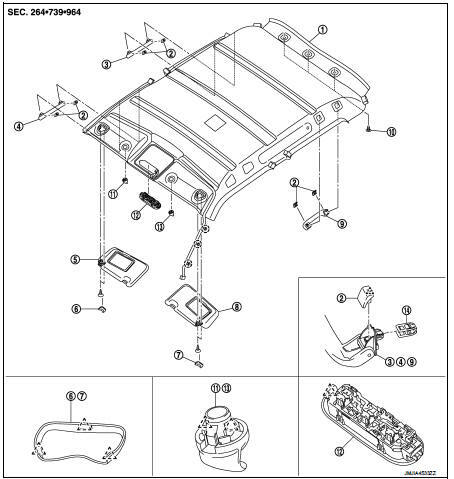 Remove sun visor assembly (LH and RH). 2. Remove sun visor assembly fixing screw, and then remove sun visor assembly. 8. Remove inside mirror and inside mirror cover. Refer to MIR-41, "Removal and Installation". 9. Remove map lamp assembly. Refer to INL-37, "Removal and Installation". 10. Remove front seat assembly (passenger). • 2WD models: Refer to SE-19, "Removal and Installation". • 4WD models: Refer to SE-27, "Removal and Installation". 11. Remove sun visor holder (LH and RH). Rotate 90°. Remove toward vehicle lower. 13. Remove headlining assembly through the back door. • Two workers are required for removal in order to prevent damage. • Apply protective tape to the portion where contact may occur during work. • Never bend headlining when removing. Note the following items, and install in the reverse order of removal. • When installing headlining, start by installing both sun visor holders and headlining clips in order to keep the headlining in position. • Never bend headlining when installing. • Be careful that the surface is not wrinkled when installing.